FOREIGN TRADE STATISTICS (ECOMEX). January 2019. Exports of goods from the Basque Country (1,941 million euros) registered a year-on-year downturn of 5.9% in January, according to Eustat data. Imports (1,673 million) also decreased by 4.2%. The trade balance was positive (268 million), but 49.6 million less than that registered in January 2018. Periodic fluctuations in Energy products determined this downturn; in the case of exports, there was a 71.2% decline (159.7 million), which was compensated for by the increase of 37.0 million in non-energy exports. The fall in exports as a whole finally stood at 112.6 million. The direct relationship that exists between imports and exports of energy products explains why energy imports were also down, although to a lesser degree, by 26.0% (154.8 million). This reduction was concentrated in the province of Bizkaia (-15.5%), due to the drop in exports of Oil and Mineral Products (-69.7%), which saw a decrease of 157.7 million compared to the same month of the previous year. Exports from Álava fell by 7.5% as a result of the 14.0% drop in Transport Material (61.7 million). However, in Gipuzkoa exports grew by 9.5%, thanks to the increase in Transport Material (26.3%), Electrical Material (6.8%) and Metals & Manufactured (5.4%). 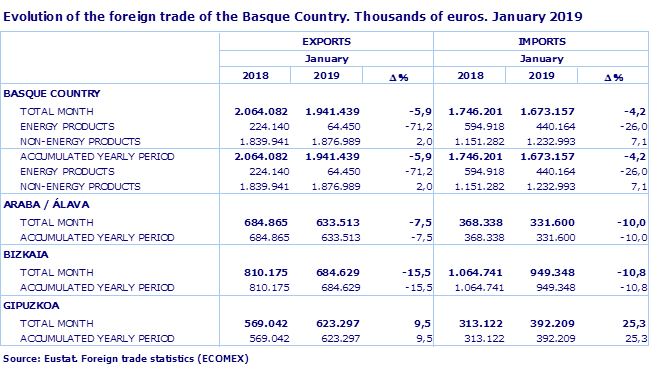 In January 2019 five countries (Germany, France, United Kingdom, United States and Italy) were our main clients, absorbing 53% of total exports from the Basque Country. Four of them belong to the EU 28, an entity that accounts for 70% of exports. Compared to the same period of the previous year, exports to France grew by 7.6%, those to the United Kingdom by 20.4% and to Italy by 4.0%. Exports to Portugal stood out, with an increase of 27.0%. However, exports to Germany were down 3.7% and those to the Netherlands to a much greater degree, with a fall of 65.9%. Exports to the United States decreased by 25.5%, as well as those to China (-49.5%), Mexico (-39.4%), Brazil (-30.0%) and Turkey (-45.6%). In January 2019 more than half of imports came from the European Union (52.4% of the total). France stood out among the most important countries in terms of imports, with growth of 10.9% (166 million), and at the opposite extreme was the United Kingdom, which registered a significant fall of 63.4% (62 million). The country that the Basque Country imported most from was Germany (237 million), which was also the country that received most of our exports (329 million); therefore, the balance with this country was positive throughout the month. Exports from the customs duty groups Oil and Mineral Products (-68.8%), Transport Material (-8.6%) and Metals & Manufactured (-7.1%), contributed to the decline in exports, with a loss of 249.6 million euros between the three groups compared to January 2018. As a whole, the total exported was 1,941.4 million euros compared to 2,064.1 million in the same month of the previous year. The year-on-year difference for the customs duty groups total was less pronounced due to the growths registered in Rubber & Plastics (56.7%) and Electric Material (13.6%), given that the two groups saw an increase of 96.7 million between them in January. The products that have lost their export momentum in January 2019 compared to the same month of the previous year include: petrols between 95 and 98 octanes (exports down 81 million euros and 84.3%), diesel goods vehicle up to 5 tonnes and 2,500cm3 (exports down 42.1 million and 24.5%), diesel vehicles for transporting fewer than 10 passengers between 1,500 and 2,500 cm3 (exports down 36.9 million and 18.9%) and machine tools for hammering, stamping and punching metals (down 18.2 million and 41.4%). On the other hand, the following all saw an increase in exports: diesel and electric motor units and motorised trams (24.6 million euros more and an increase of 949.2%), rubber tyres for buses or lorries and tyres for passenger cars (43.7 million euros more between the two groups, up 190.3%). Imports of goods to the Basque Country experienced a drop of 4.2%, reaching a total of 1,673.2 million euros. Energy imports fell by 26.0%, and non-energy imports were up 7.1%. Imports for Gipuzkoa grew by 25.3%, and for Bizkaia they were down 10.8%, as in Álava where they dropped by 10.0%. Analysing imports by customs duty groups, it can be observed that the largest, Oil and Mineral Products (27.9% of the total) saw a decrease of 23.5%. Transport Material also fell (-14.9%) as a result of fewer imports of vehicle parts and accessories (10.9 million less than in January 2018), as, for example, in gearboxes, which dropped by 33.6% (down 6 million euros). By contrast, Metals & Manufactured were up 18.8%, as were Paper & Manufactured (48.9%).